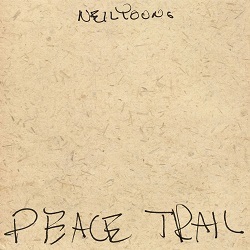 Peace Trail features all new songs that Neil Young wrote since the release of his album EARTH, and recorded within a short time span. The album is primarily acoustic and reflects an intimate, sparse approach that draws the listening into the heart of the songs in a personal way. Each song is rich with Young’s typically inviting lyrical expression of his inimitable impassioned and heartfelt life-long humanitarian concerns which remain as topical and timely as ever. Second full-length statement from Memphis' NOTS, Cosmetic fearlessly attacks the rough edges between desire, deceit, appearance and reality. Not chanting down Babylon, Natalie Hoffmann screams straight into its face. In this Game Of Death, Nots run through the maze of mirrors with sledgehammers. Oh, the sound of mirrors smashing. Let's smash some more. Nots are still a wild guitar band, but above and below the guitar, bass and drum pound, Alexandra Eastburn's analog synth blurps melodies and nonsense, teasing squiggles of freedom which defy the false grid of modern life. Cosmetic? Emetic? "Monotone Lust" indeed. With Hoffmann on guitar & vocals, Eastburn on synth, Charlotte Watson beating drums, and Meredith Lones steering a solid path through the chaos on bass, Nots are neither content with the smug "stare at your shoes" approach of bands from both coasts, nor an Earth-hugging "we need to get back to nature" hippie copout. There might not be any answers here. That might be the point. 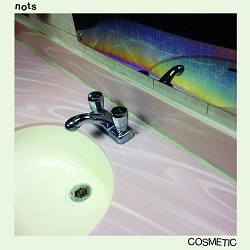 Nots have arrived at the next level of their attack with a confidence and a music that lays waste to the wasteland without romantic attachment to a thing.